This Companion provides a comprehensive account of this outstanding work, which remains among the most frequently read works of Greek philosophy, indeed of Classical antiquity in general. The sixteen essays, by authors who represent various academic disciplines, bring a spectrum of interpretive approaches to bear in order to aid the understanding of a wide-ranging audience, from first-time readers of the Republic who require guidance, to more experienced readers who wish to explore contemporary currents in the work's interpretation. The three initial chapters address aspects of the work as a whole. They are followed by essays that match closely the sequence in which topics are presented in the ten books of the Republic. Since the Republic returns frequently to the same topics by different routes, so do the authors of this volume, who provide the readers with divergent yet complementary perspectives by which to appreciate the Republic's principal concerns. 1. The protreptic rhetoric of the Republic Harvey Yunis; 2. 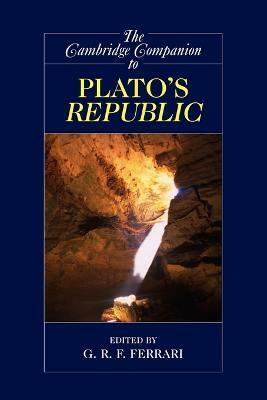 The place of the Republic in Plato's political thought Christopher Rowe; 3. Rewriting the poets in Plato's characters David O'Connor; 4. Wise guys and smart alecks in Republic 1 and 2 Roslyn Weiss; 5. Justice and virtue: the Republic's inquiry into proper difference Aryeh Kosman; 6. The noble lie Malcolm Schofield; 7. The three-part soul G. R. F. Ferrari; 8. Eros in the Republic Paul Ludwig; 9. The utopian character of Plato's ideal city Donald Morrison; 10. Philosophy, the forms and the art of ruling David Sedley; 11. Sun and line: the role of the good Nicholas Denyer; 12. Beginning the 'longer way' Mitchell Miller; 13. The city-soul analogy Norbert Blossner; 14. The unhappy tyrant and the craft of inner rule Richard D. Parry; 15. What is imitative poetry and why is it bad? Jessica Moss; 16. The life-and-death journey of the soul: interpreting the myth of Er Stephen Halliwell. 'Eminently suited to guide students, whether graduates or advanced undergraduates, through this intimidating text while at the same time introducing them to significant contemporary disputes in its interpretation. The Companions chapters ... are to be congratulated for resisting the tendency to mystification.' Edward Butler, Metapsychology 'A book that all admirers of Ethics with Aristotle will read with great pleasure.' Revue philsophique de Louvain "Eminently suited to guide students, whether graduates or advanced undergraduates, through this intimidating text while at the same time introducing them to significant contemporary disputes in its interpretation.. The Companions chapters...are to be congratulated for resisting the tendancy to mystification." Edward Butler, Metapsychology "This book is a bargain, and any serious scholar working on the Republic ought to own it." G. R. F. Ferrari is Professor of Classics at the University of California, Berkeley.